I didn't think The Hobbit could be stretched into 3 separate movies without being boring. I was wrong. I saw it last night and it wasn't boring. Peter Jackson wins again. I anticipated it all being so tedious: meeting the dwarves, getting out of the Shire, the singing. But it wasn't. I love the dwarves. I even liked the singing. To watch it feels like reading the book. Everything is described in great detail. I wouldn't have wanted them to cut anything. About halfway into the movie I just submitted entirely to Peter Jackson's will. 2 more movies? 3 more movies? Whatever. I would watch all of them, happily. It's great fun. I can't wait to take the kids. One thing I loved about it, especially, is getting to see Gandalf as action hero. In The Hobbit we get to see more of pre-white Gandalf within the context of the other wizards and guardians. Gandalf is of the people, you know? He's got his ear to the ground and knows the locals, unlike that hoity toity Saruman who thinks he knows better—And we all know what happens to him. (I just hope they already filmed all of Christopher Lee's scenes because he doesn't seem long for this world, by which I mean actual earth. )Yes, Gandalf has some magic at his disposal but he is also pretty good at simply stabbing orcs. Go Gandalf. You are awesome and I hope you never die permanently. Do I love you more than Dumbledore? Maybe? All I know is this: I'd like to discuss it with like-minded people for about 5 hours. I also loved Martin Freeman as Bilbo. He is SO much better than Elijah Wood was as Frodo. I loved all the Lord of the Rings movies but Frodo has always bugged me. I don't like how Elijah Wood says things or looks. Is he a good actor? Maybe his face is just too smooth and his eyes are creepy? Merry, Pippin, Samwise—they were all better than Frodo. We let it go because Frodo was the ring bearer so we thought maybe that was why he was a drag and looked like a toddler and didn't fit in and rolled his eyes into the back of his head grossly so much. 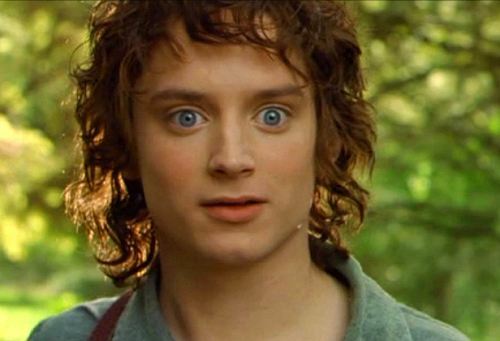 Seeing Martin Freeman as Bilbo makes me regret Elijah Wood as Frodo. But that's in the past. I can let it go. Of course, in The Hobbit it's the future. I can't help but wish for a better one. 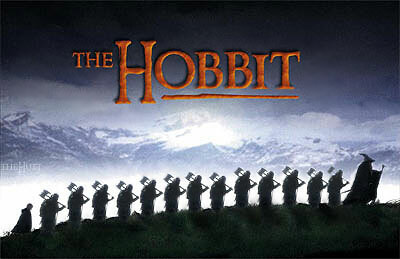 I'll be posting more about The Hobbit on Babble later today but for now you just need to know that you should see it. It's good. It's not boring. It's clever. Gandalf is charming. You'll love Bilbo. The dwarves (and, this is surprising) don't get old. You're actually going to care about the dwarves. The backstory is interesting. The action is exciting. Gollum is better than ever. The LOTR foreshadowing makes for a lot of prequel-ly goodness. At least, I thought so. Instead of taxing my interest in Middle Earth yore, it made me want to learn more. In fact, while perusing my Tolkien Bestiary late last night I actually got really stoked about reading the Silmarillion. Yeah, I say stuff like that. So maybe this review is not objective. Just so you know, the movie is not exactly like the book (awesome comparison, here). But then, Bret from Flight of the Conchords isn't in the book either. Change can be good. I'm going tomorrow and I. Can't. Wait!!!! I'll probably see it again tomorrow with my kids. How intense is it? Too much for a 9 year old? Trying to decide if everyone is going to see it, or just older kids. Totes dying to see this. And I wholeheartedly agree about Frodo. I mean, WATSON as Bilbo is almost as good as Sherlock as Sherlock. Oh man I didn't realize he was in it too! I am dying to see it! I thought it was good, but not great. I generally thing the LOTR is great. I think it would be better as 2 movies, not three. And it was a tad too violent for me. But. It really was enjoyable. The score was great, and the movie was fun to watch. Also, I got a kick out of all the people dressed up as Gandalf, elves, and even Gollum, himself. 1. My absolute favorite part of The Hobbit was Martin Freeman. He was outstanding. And I totally agree; a thousand times better than Elijah Wood. He always bugged me, especially compared against the awesomeness of the other hobbits. However, with Martin Freeman I found it so much easier to relate to Bilbo. I didn't expect to be so moved by his ordinariness and humility. 2. Totally agree with your Gandalf assessment. 3. In light of the events of Connecticut yesterday I was worried I wouldn't be able to just sit back and enjoy the movie. Surprisingly, the movie meant that much more to me. I just kept thinking, "GOOD ALWAYS TRIUMPHS!!" and fist-pumping in my head. It also reminded me that Divinity and goodness are always surrounding us, even through tragedies. 4. Although I loved the movie and we really can't wait for the second part to come out, I do wish it was a tad less nightmare-inducing. All of my boys are little and we're reading the book right now together. I would've loved to take them too it but we'll have to wait a few years. Tolkien wrote it as a children's book and I really would've like to see the intensity more on scale with the Narnia movies. (but with the PJ awesomeness) All in all, fantastic movie. I found myself wanting to go home and read more of the Lord of the Rings. "However, with Martin Freeman I found it so much easier to relate to Bilbo"
easier than in the book. Pretty stoked about this movie, can't wait to see it!